Oh, sure, I've seen this before. You remember those bell-shaped aliens from another universe in that 1931 story, right? Okay, maybe not. But I do. This versatile item of apparel also comes with two reusable drink containers. Surveillance of schools now an enjoyable activity, claims UK school principals. Your face is your password, your keycard and your timecard. Good thing it doesn't need to punch your card. 'The road you're on, John Anderton, is the one less traveled...'- Steven Spielberg, 2002. 'Al was hastily donning his space suit...'- Schachner and Zagat, 1931. 'Rapidly, purposefully, the metallic fingers moved over the key-boards...'- Schachner and Zagat, 1931. '...machines did the work of man, and the aristos, owners of the machines, played in soft idleness...'- Zagat and Schachner, 1931. 'Not the slightest change in their working betrayed the fact that they were now being directed by a machine instead of human beings. 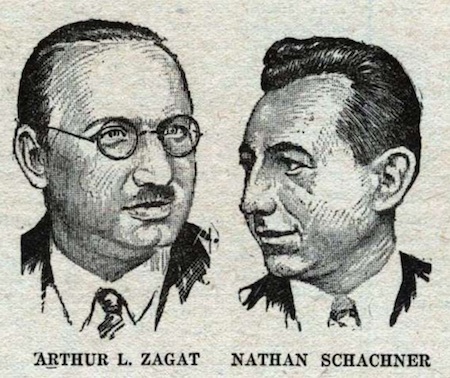 '- Schachner and Zagat, 1931. 'The ten forked ends of each arm commenced a rattling pressing of the buttons. '- Schachner and Zagat, 1931. '...A rattling pressing of the buttons.' - Schachner and Zagat, 1931. Welcome, SpaceX, to the club of space suit imaginers and makers. Yes, people of the future, robots will dress you.